Home/Tutorials/What Plants Are Right for My Zone? Understanding your planting site conditions is vital to long-term tree plot success. Seven very important variables need to be considered when choosing the proper tree species for hunting success: hardiness zone, sunlight requirements, soil type and pH, hydrologic conditions, topography and terrain, spacing requirements, and naturally occurring dominant tree species. Flatwood Natives offers zone maps and charts on our website, which will help narrow these variables depending on your location. 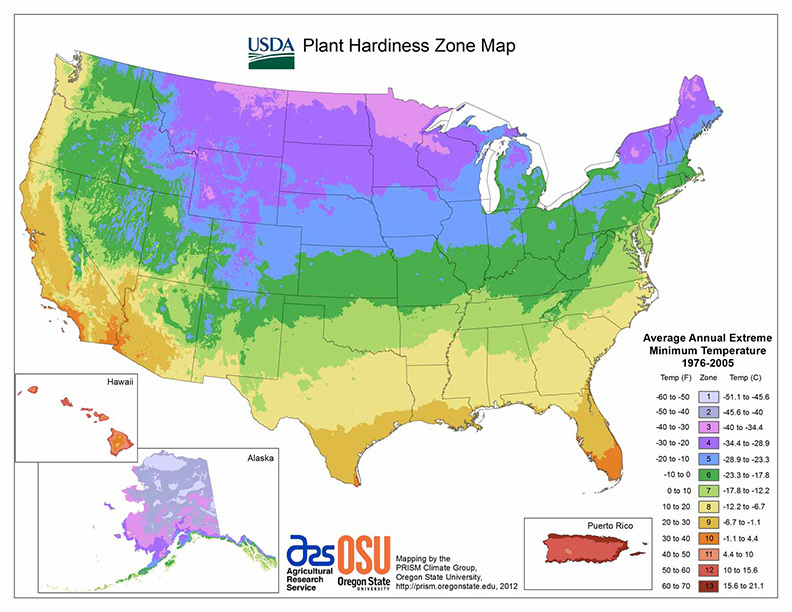 While some variables—including hardiness zone, sunlight requirements and spacing requirements—can be solved using the interactive maps and charts, soil type and pH, hydrologic conditions, topography and terrain, and naturally occurring dominant species need to be assessed at the site. A soil sample is highly recommended prior to planning your planting site, and Flatwood Natives can show you how to take a soil sample here on our site. Hydrologic conditions, as well as topography and terrain need to be considered as certain species can tolerate a broad range of hydrology, where others may not. It is also important to consider tree size at maturity and select species that will not overcrowd your tree plot site by using our “Spacing Chart”. Selecting tree species that are not already common in your area will help attract whitetails and increase opportunities to fill your tag. Flatwood Natives will customize your tree plot package to match all of these variables in order to provide high-quality trees for hunting success!